In a usual week I cook f chicken Marsala or Chicken Francaise… Two gallons of white wine based sauces (yes, some of the wine I even put in the sauce!). I bake and slice at least 50 lb of Angus Sirloin, and probably some 5 whole pork loins, baked whole with herbs crust and served in mushroom sauce. In the same time my old Polish ladies in the same kitchen cook endless trays of Pierogi, Kielbasa, Sauerkraut, Stuffed Cabbage… Tons and tons of it every week Literary tons. I process a ton of just cabbage every week. I shouldn’t say that, but it will not come to you as a surprise – I can’t eat no chicken Marsala or Roasted Beef or Pierogi or Stuffed Cabbage any more… Although I can cook those with no effort – for me, my family or my friends – just add a bit more to the pan – I just can’t. I had some private parties in last month or so (seems that everybody, including me, was born in March and April), I had some family and friends over – even some fellow colleagues (cooks) – and I took some pictures of the food that I prepared for us. Here is what a cook cooks when he is cooking for himself and friends. Yes, that is Foie Grasse. There has to be some foie Grass on this list, this is a self indulgent, rebel, sinful list, and as such it is bound to be immoral and a bit perverse. 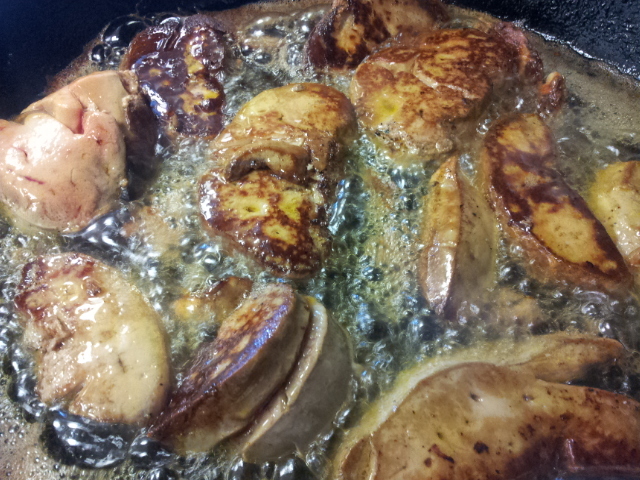 Yes, there it is, perfectly fried goose liver in its own grease. I serve it just like that, on a piece of Croissant, in a reduced Modena vinegar… – to me. But my family prefers it made into a paste, with some good sweet cognac and/or Porto, spread on a piece of toast… If you never tried it, you should, it is a taste and texture that is unlike anything else. Then, here is my American revelation – Corned Beef. I love American beef, it is far superior to the terrible dry, tasteless, chewy thing we cook in Europe. But to put the hardest (and the tastiest) muscle of Beef in the Brine we use for Ham – that was an idea of a genius. I just love to prepare Corned Beef, not only in March. And just like you will never find meatballs&pasta or anything like the Italian sausage in Italy, you will surprise any European Irish with the Corned Beef. It is not much used there (nowadays they do sell it to the tourists, they just have too) and it never was. Although it was produced there since the 12th century, it was a luxurious commodity sold exclusively to the British. Irish never ate any of it – and this is why it became so popular among Irish immigrants in New York – something rare and too expensive in their home country here was so cheap and everywhere. 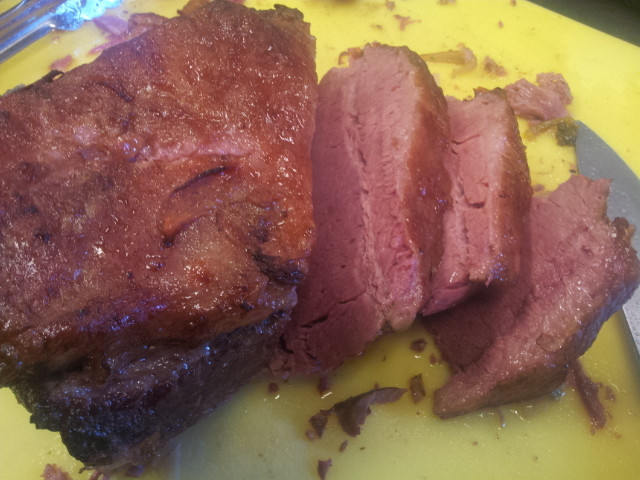 I shouldn’t, but I will tell you my secret of making the perfect Corned Beef. I cook it in a mixture of beer and beef broth (yes, half&half, 9 perfectly good heinekens went into that pot). I don’t like to use Guiness – to much caramel and sourness. When is fork tender I take out and bake it in a very hot oven for 15 minutes just to turn that pink outside fat into a delicious brown crust. I skip the cabbage (see the beginning of the post) and eat it with my amazing mashed potatoes (a lot – a lot – of good yellow butter). Having a bunch of friends over again, right? No, no, it’s all for me, – I responded absentmindedly. Oh, – the clerk nodded with a smirk.No, no, no, thought panicking, I’m not an alcoholic. I, I cook with it, it’s all for cooking. Yes, that’s what they all say – she said with a smile, leaving me wondering if she believed me and was only joking – or not. Here is a picture of me cooking with beer again. Those are pork shanks, the most delicious part of the pork, really. 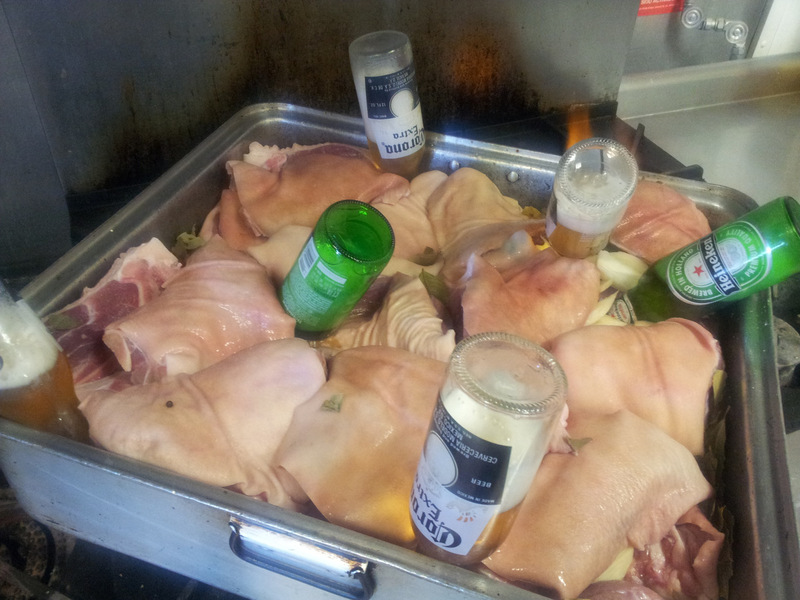 I baked them in all that beer, 20 onions, 10 garlic heads and water and pepper cloves…. for 8 hours. When all the fat melts, when that skins turns into a purple brown thin crust and the meat gets soaked in the most wonderful and rich broth ever, then it is ready. That what you see there is 60 lb of pork shanks, 40 pieces. 10 pigs lifetime commitment. It was barely enough for 30 hungry Polish guests. Go figure. Good Polish Mustard. Sauerkraut. More beer. I skim the fat from the broth that is left in a pot, I add to it some pieces of the meat, some boiled vegetables, maybe a boiled egg, a bit of vinegar – and cool it down in a bowl. Then I just thurn the bowl upside down on a plate – and you have the most fantastic jello ever (I do not like sweets too much). And fish, I cook so much fish for myself. Check out my cookbook somewhere on this blog – it is mostly fish. 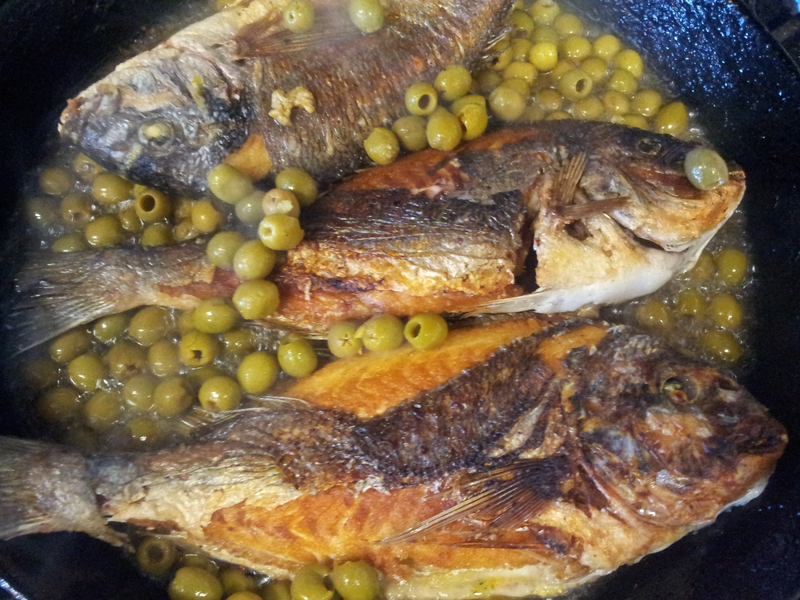 Fried on a hot hot olive oil and then covered with olives. I do not salt or season this fish – the olives have all the salt necessary. There are few tastes that go together so good like fish and olives. No other spices needed. Except the wine, of course. Like they say in my country, fish swims three times – in the sea, in the oil and in the wine. That last part you mix in your mouth and belly.